Programmed exclusively for the Atari 8-bit computers, Gauntlet (no relation to the popular Atari arcade game released one year later) was one of the earliest "cave-flyers ." 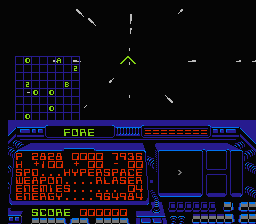 It was also one of the earliest games that functioned in the shareware mode of distribution, though the word had not been coined yet, and was generally distributed on BBSes. In Gauntlet, you control a lander-like ship in a zero-gravity two-dimensional cave environment. Pressing the joystick in any direction thrusts in that direction, and your lander maintains that direction's momentum until you thrust in the opposite direction. 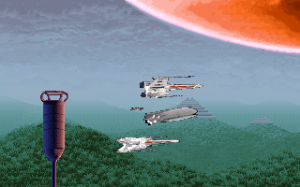 Meanwhile, holding down the fire button while pointing in any direction fires the ship's weapons in that direction, allowing the player to drift in one direction while firing in any other direction. However, the controls are simple and intuitive, and do not involve the complex physics and difficulty of control characteristic of more "realistic" lander-type games (indeed, at any moment you can press the X key to stop all movement whatsoever). Your ship can fire two kinds of weapons: fusion bolts, of which you have unlimited ammunition, and missiles, of which you begin with ten and are replenished periodically. The fusion bolts are fired in a steady autofire, limited to six bolts on-screen at any given time, creating tiny explosions. There are three kinds of missiles available: homing missiles that have their own damage capacity and thus can seek and destroy multiple smaller objects, dumbfire "flares" that are indestructible and damage everything in their path, and dumbfire "tridex" missiles that create large explosions. The catch is that you must select which type you will use at the beginning of the game, and you cannot change it in-game, so you're stuck with what you pick. In the same style as games like Scorched Earth, the environment in Gauntlet is completely destructible -- and in several screens you must blast your way through cave walls in order to progress to the next screen. Thus, you can often get the odd satisfaction of seeing a pockmarked landscape after a particularly tough fight. 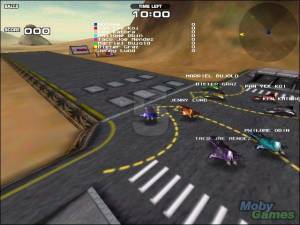 There is also, however, an option to play the game without any landscape whatsoever. Your ship has a shield that begins with 30 damage points and, like everything else in the game, takes damage continuously as long as it is in contact with an explosion or some other object (so, if you're glanced by an object or an explosion, you may only take one damage point, but if you run right through an explosion, you can find you've lost 15 or 20). Every screen you progress through you gain 2 more and are awarded 100 points for every point you have remaining. Every 10,000 points, you are awarded an additional 10 damage points, up to a maximum of 99. Thus, it is important to build up your shield in the early game so that it brings in enough points every one or two screens to replenish it via the 10,000-point bonus. 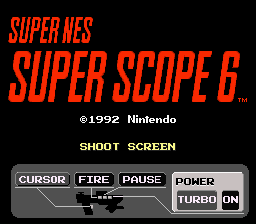 You progress from through fifty screens (thirty above-ground and twenty below), in which you face increasingly more difficult enemies and in which the action gets often gets fast and furious, as it were. 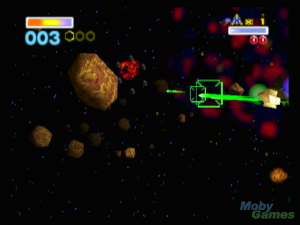 Enemies include homing mines that come after you if you get too close, ground installations that fire all sorts of guns and missiles at you (particularly the nasty homing ones), and all sorts of little alien ships whose firepower increases as you progress and who behave differently, some, for example, using the terrain to avoid your shots. Throughout the game, you must use the terrain to your advantage and avoid revealing yourself to all enemies on-screen to avoid being swarmed. Eventually, you face the Kingship on screen 50, a nasty bugger. One of the most noteworthy aspects of Gauntlet, beside its sophisticated treatment of movement and intertia, was the sheer number of moving objects it can have on the screen at once -- often ten or so enemies, six of your fusion bolts and scads of enemy shots and missiles. Sight unseen, the author accomplished this impressive feat through very tidy assembly-language packed into 28k. Few other action-arcade games matched the complexity and dynamism of the action and physics modeling in Gauntlet, and it might have received much more attention had Atari not released its coin-op hit Gauntlet (which was also ported, of course, to the Atari 8-bit) at roughly the same time.